How many different bottles of cleaning and beauty products sit under your sink right this moment? If you peeked under my sink just a few years ago, you would have counted at least twelve or more products. I never sat down to calculate the amount of money I spent on all those unique cleaners and beauty products, but the annual cost was quite significant. Slowly, one by one, I started to question each product I deemed as “essential” for cleaning and beautifying my body. 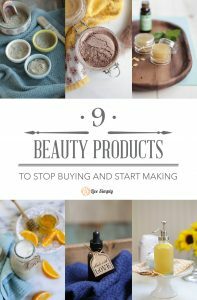 Why did I need a million different products with a gazillion different toxic ingredients? I decided to research the idea of making my own products. My research led to the discovery of a natural product that cleans anything and everything: castile soap! 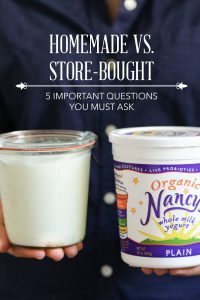 If you’re new to homemade products or just want to expand your current inventory, I recommend making products that contain the same basic ingredients. Today’s recipe list is a great place to start since multiple homemade products can be made with just one 32-ounce bottle of castile soap. For cleaning products I use: Lavender, Tea Tree or Citrus. For beauty products I use: Lavender, Tea Tree or Baby Mild. Hand Soap: With two active kiddos we go through a lot of hand soap in our house! A bottle of natural hand soap costs $3.99-$6 a bottle, depending on the brand. 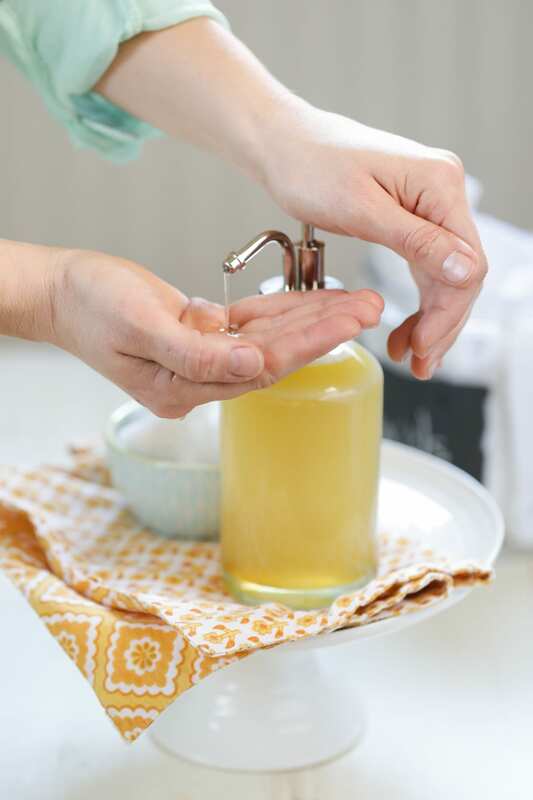 One 32-ounce bottle of castile soap makes approximately 8 homemade bottles of hand soap. Laundry Soap: As much as I dislike the folding process, I love the act of washing clothes. Call me crazy, but I think there’s something incredibly rejuvenating about the act of washing a load of laundry. This homemade laundry soap is made with just a few basic ingredients: (bar) castile soap, borax, and washing soda. All-Purpose Surface Cleaner: An all-purpose surface cleaner not only cleans and disinfects, but also smells great! 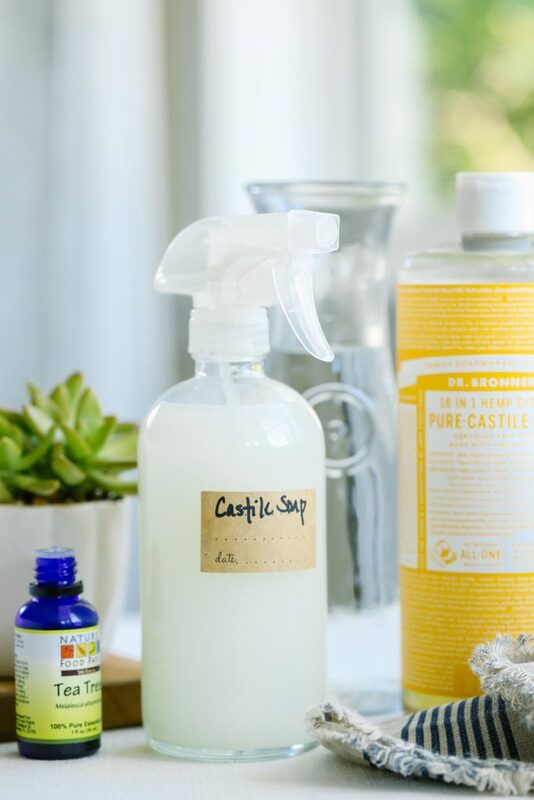 This surface cleaner only requires 4 tablespoons of castile soap per spray bottle (PS: I love these glass spray bottles), which means you’ll be able to make approximately 16 bottles of homemade cleaner with one 32-ounce bottle of castile soap. Body Wash: Just because body wash is a luxury doesn’t mean you have to pay luxury prices. Castile soap is one ingredient in my homemade body wash. One 32-ounce bottle of castile soap will make multiple bottles of homemade body wash.
Facial Wipes: Facial wipes are a convenient way to remove make-up or cleanse your face on the road (or in the air). Store-bought wipes contain toxic ingredients and come at a hefty price. Making your own homemade facial wipes is easy and inexpensive with castile soap, baby washcloths, witch hazel and a nourishing oil. One 32-ounce bottle of castile soap will make at least six months worth of facial wipes! Face Wash: Over the years I wasted a lot of money on fancy face wash products. Thankfully, I now save hundreds of dollars each year by making my own face wash at home with common ingredients: honey, castile soap, water and a nourishing oil. One 32-ounce bottle of castile soap makes approximately 10 bottles of homemade face wash.
Bathroom Cleaner: This inexpensive homemade bathroom cleaner combines the power of castile soap, baking soda, water, and disinfecting oils. One 32-ounce bottle of castile soap makes approximately 16 bottles of germ-fighting bathroom cleaner. So this may sound like a silly question but I’m going to ask it anyway… I’ve noticed you put essential oils into a lot of your DIY products for fragrance, well I LOVE the smell of vanilla and was wondering if it would be a bad idea or not to put vanilla extract into things like the body wash? Hey Annie, Not silly at all :). Vanilla extract may be used in the body wash (or other homemade products). Hey Wendy, I don’t know of any substitutions for the castile soap. Maybe a more natural dish soap could be used for something like the bathroom cleaner? Well.ca is a Canadian company and carries dr bronners Castile soap. Hi I am from quebec too and Its in every health stores and organic sections. Good luck in. Your search. I am also from Quebec – I buy my Castile Soap from Amazon but I was in Provigo the other day and in the Beauty section – low and behold – I found several kinds of Castile soap – check your neighbourhood Provigo! Wow, thanks for sharing, Debbie! I recently tried vanilla in a foaming liquid soap and it works beautifully. For hubby’s soap I put in anise because of his love of licorice and he absolutely loves it. Have been using DIY recipes for a couple of years now and I’m so thrilled to have more that include castile soap so thank you. I do use castile full strength in the kitchen sink. 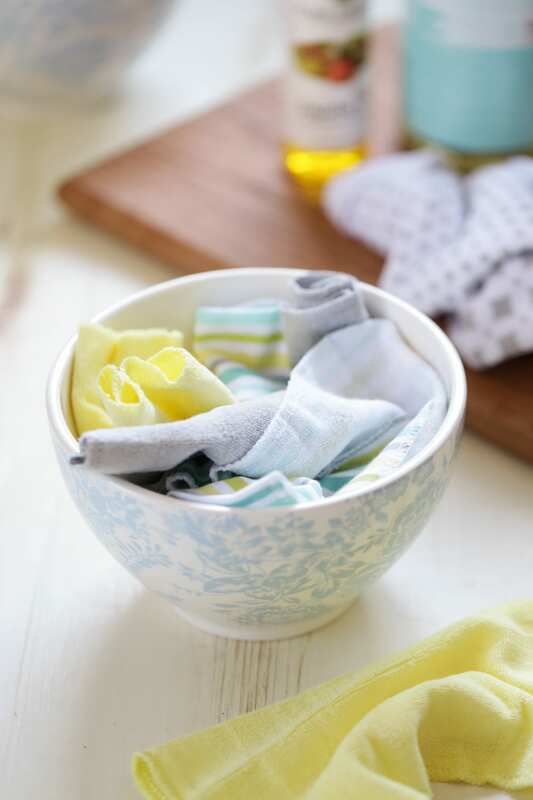 Two or three drops and wipe with a damp cloth gets rid of grease with just a swipe of a damp cloth and a rinse with hot water leaves it gleaming. Awesome, Sharon! Thank you so much for sharing. I just had to tell you, I have been a big diy kind of girl for many moons. And when I couldn’t figure out how to clean my bathroom on my own, I stumbled across your website. Holy cow, I am so excited! It is all so yummy! I’ve used Tilex for years (my one concession to chemical soup) because I have tendonitis in both hands & just couldn’t scrub. So I tried your tub cleaner recipe & it is just spectacular. Same with the general purpose cleaner. Even the tea tree oil doesn’t smell strong as the other ingredients balance it out nicely. So amazing! I cannot tell you how excited I am & what your recipes have done to change my life. I know I may sound silly, to have such enthusiasm but I am so very thankful that you shared your recipes with the world. Thank you so much, Caro!! 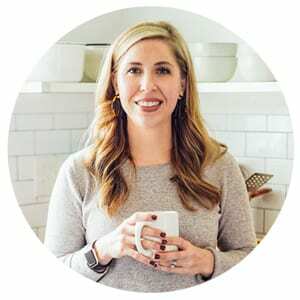 I’m so glad you’re enjoy Live Simply and all the DIY recipes :). I have a new bathroom cleaner (for the inside of the toilet bowl ;)) coming out next week…I think you’ll love that one. I have been wanting a toilet bowl cleaner! Yay! Just need to thank you. Have been looking for natural ways to get rid of acne and your astringent is just what I need. Tossed out the store bought stuff and hit the natural food store for the ingredients and natural oils. Awesome, Elsa! I’m so happy for you. Awesome, Densise Michelle! Peppermint castile soap is wonderful! Hi Kristin! I am a really big fan of natural cleaning solutions and I work as a cleaner part time for a local company. 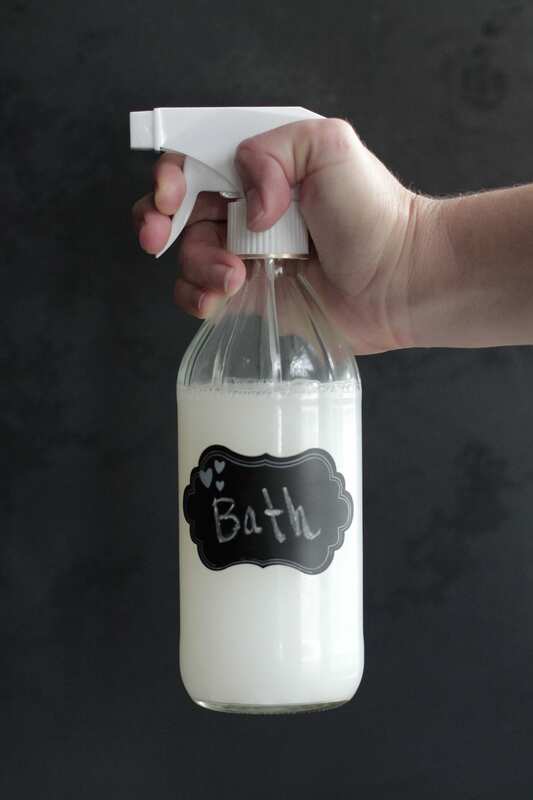 I love to use homemade cleaners like vinegar and essential oil sprays, and baking soda cleaners. I’ve also heard what a great cleaner the castile soap is. Thank you for the lovely post! 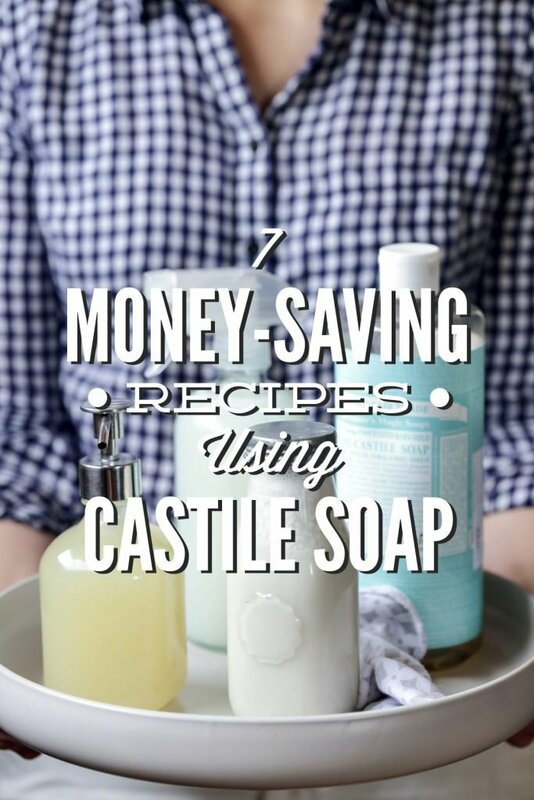 I will definitely try the castile soap as a cleaner! 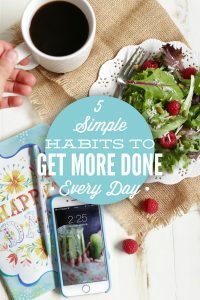 Just found your website on Pinterest and LOVE it! I just found a bottle of castile soap that I had forgotten about. Excited to put it back to use, thanks for the tips. That’s awesome, Jo! Welcome to Live Simply! Hi Kristin! I saw a post about liquid laundry soap with a new ingredient that you just LOVE!! It is not the one made with water, borax, and castile soap. I didn’t save it and now I am looking for it and cannot find it! *sad face Can you point me in the right direction, please? Hey Felicia, Hmmm, maybe that’s my dry laundry soap powder? 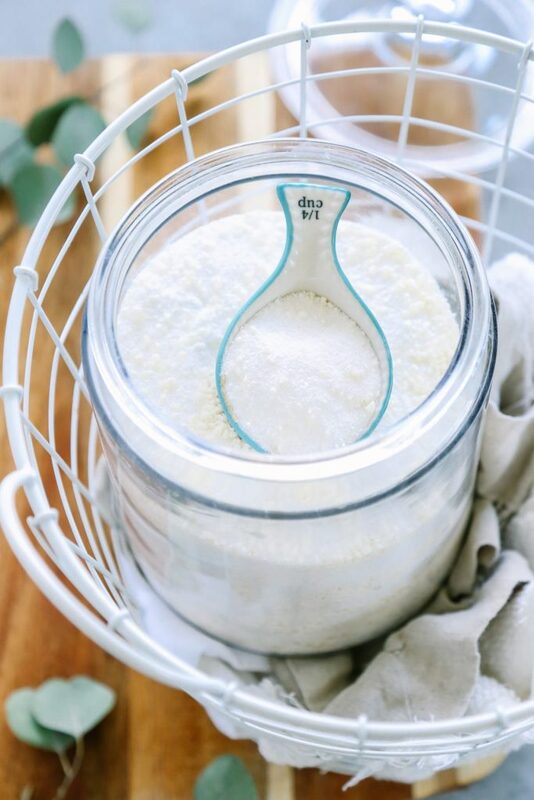 That’s my newest recipe and I just love it: https://livesimply.me/2016/02/26/homemade-powder-laundry-soap-detergent/. I use 2 Tbls. Liquid bronners, 3 Tbls borax, and 3 Tbls. Washing soda. And about a gallon of water. 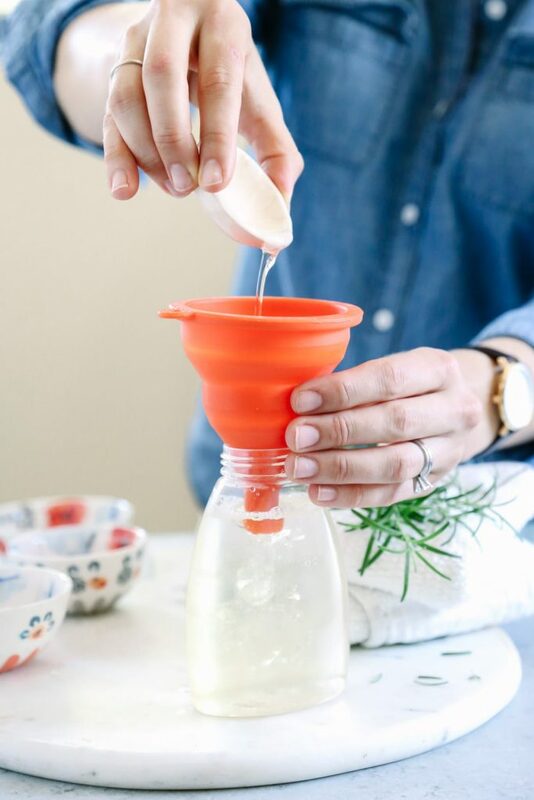 I boil around 4 cups of the water, then mix in the soaps, let cool and pour into a recycled gallon jug (I use old juice jugs lol) then I fill almost to the top with water. Since the jug is plastic you want to make sure it’s cool enough not to melt the jug. This cleans nicely, I even washed my cloth diapers with this! And of course it’s super cheap too! You can always add a little more soap or your favorites stain booster to make it stronger for the really dirty loads. Awesome, Crystal! Thank you for sharing. I love hearing how people use castile soap. I noticed all your glass bottles are clear instead of brown or cobalt. I always thought that if essential oils were in the mix, it needed the coloring to protect them? Hey Theresa, I store my bottles in a dark cabinet, under our sink, so that’s why I’ve been able to use the clear bottles. As long as short-term products are stored out of direct sunlight, you should be okay. If I use the spray cleaner to clean counters, etc., do I need to rinse after using? Hey Tatergirl, I usually go over the counters with a damp rag. I noticed that you use distilled water in the cleaner, can you use regular water? One of my 2019 goals is to weed through the clutter of commercial cleaning and personal care items encumbering our shelves and cupboards. Another goal is to set up a workable planning system so I just added the link to this site to the “Projects” section of my planning binder. Thanks! !